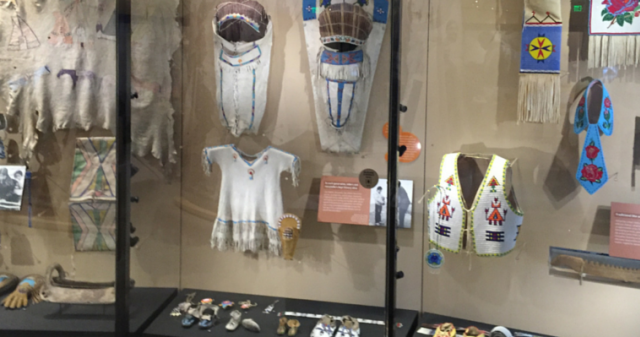 "Weaving a Revolution," a special exhibit appearing at the Natural History Museum of Utah now through April 28th, tells the story of a renaissance of Navajo basket weaving that has taken place over the past thirty years in the Utah strip of the Navajo reservation near Monument Valley. "Weaving a Revolution" features more than 150 works of art created by basket makers from the Monument Valley, Utah area. A cluster of families - the Blacks, Bitsinnies, and Rocks - have combined tradition and innovation, continuing to make ceremonial baskets and also creating original patterns to tell their own stories. The result is a stunning display of color, artistry and history that&apos;s uniquely Utah. Photo by Marsha Maxwell. Read more from Marsha Maxwell.